Lonnie Zamora (September 7, 1933 – November 2, 2009) was a New Mexico Police officer who reported a UFO sighting while on duty on Friday, April 24, 1964, near Socorro, New Mexico. Alone in his patrol car, Sergeant Lonnie Zamora was chasing a speeding car due south of Socorro, New Mexico on April 24, 1964, at about 5:45 p.m., when he "heard a roar and saw a flame in the sky to southwest some distance away — possibly a 1/2 mile or a mile." Thinking a local dynamite shack might have exploded, Zamora broke off the chase and went to investigate. Project Blue Book he goes to some lengths to describe the long, narrow, funnel-shaped "bluish orange" flame. He thought there might be some dust at the bottom, and attributed it to the windy day. The weather was "Clear sunny sky otherwise — just a few clouds scattered over area." He describes the noise as "a roar, not a blast. Not like a jet. Changed from high frequency to low frequency and then stopped. Roar lasted possibly 10 seconds" as he approached on a gravel road. "Saw flame about as long as heard the sound. Flame same color as best as recall. Sound distinctly from high to low until it disappeared." He explains that his car windows were down. Zamora notes no other possible witnesses except possibly the car in front, which he estimates might have heard the noise but not seen the flame because it would be behind the brow of the hill from their viewpoint. Zamora struggled to get his car up the steep hill, and on the third attempt, which was successful, he noted no further noise. For the next 10–15 seconds he proceeded west, looking for the shack whose precise location he did not recall. It was then that he noticed a shiny object, "to south about 150 to 200 yards", that at first he took to be an "overturned white car ... up on radiator or on trunk", with two people standing close to it, one of whom seemed to notice him with some surprise and gave a start. The shiny object was "like aluminum — it was whitish against the mesa background, but not chrome", and shaped like a letter "O". Having stopped for a couple of seconds, Zamora approached in his car meaning to help. Zamora only caught a brief sight of the two people in white coveralls beside the "car". He recalls nothing special about them. "I don't recall noting any particular shape or possibly any hats, or headgear. These persons appeared normal in shape — but possibly they were small adults or large kids." Keeping the object in view he ran behind his car, bumping his leg on the rear fender and dropping his glasses, and continued running northwards away from the object, which was still near the ground. He now gives a more detailed description of the object. "Oval in shape ... smooth — no windows or doors ... 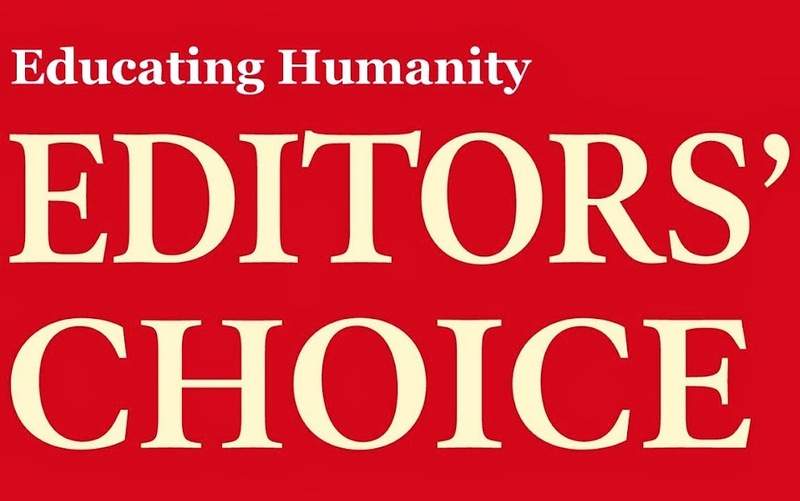 Noted red lettering of some type (see illustration). Insignia was about 2½' high and about 2' wide I guess. Was in middle of object ... Object still like aluminum-white." He also noted that the object was still on the ground when the roar started. “ After fell by car and glasses fell off, kept running to north, with car between me and object. Glanced back couple of times. Noted object to rise to about level of car, about 20 to 25 feet guess — took I guess about six seconds when object started to rise and I glanced back. I ran I guess about halfway to where I ducked down — about fifty feet from the car is where I ducked down, just over edge of hill. I guess I had run about 25 feet when I glanced back and saw the object level with the car and it appeared about directly over the place where it rose from. I was still running and I jumped just over the hill — I stopped because I did not hear the roar. I was scared of the roar, and I had planned to continue running down the hill. I turned around toward the object and at same time put my head toward ground, covering my face with my arms. Being that there was no roar, I looked up, and I saw the object going away from me. It did not come any closer to me. It appeared to go in straight line and at same height — possibly 10 to 15 feet from ground, and it cleared the dynamite shack by about three feet. Shack about eight feet high. Object was travelling very fast. It seemed to rise up, and take off immediately across country. “ Gave directions to Nep Lopez at radio and to Sergeant M.S. Chavez to get there. Went down to where the object had been and I noted the brush was burning in several places. At that time I heard Sgt. Chavez (N.M. State Police at Socorro) calling me on radio for my location, and I returned to my car, told him he was looking at me. Then Sgt. Chavez came up, asked me what the trouble was, because I was sweating and he told me I was white, very pale. I asked the Sgt. to see what I saw, and that was the burning brush. Then Sgt. Chavez and I went to the spot, and Sgt. Chavez pointed out the tracks. Coral Lorenzen of APRO, and Sgt. Castle of the Military Police. Within hours, word of Zamora's encounter had reached the news: many people had heard the radio traffic, including a few reporters. Within days, reporters from the Associate Press and United Press International were in Socorro. 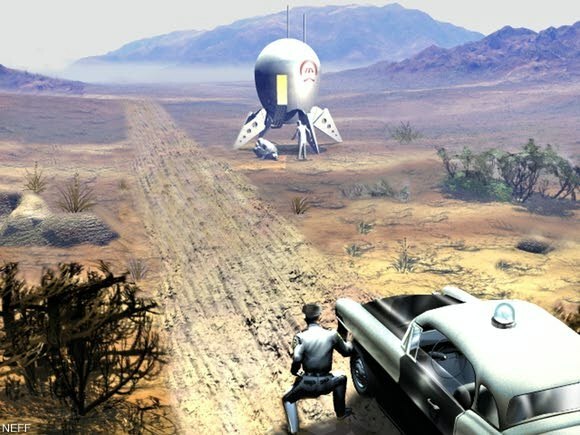 Members of civilian UFO study group APRO were on the scene within two days, as were officers representing the U.S. Air Force's Project Blue Book. NICAP investigators appeared the following Tuesday. The first NICAP investigator was Ray Stanford, who would later write a detailed book account of his investigation . Several independent witnesses reported either an "egg" shaped craft or a bluish flame at roughly the same time and in the same area — some of them within minutes of Zamora's encounter, before word of it had spread. Stanford wrote about a number of corroborating witnesses in his book, including two tourists named Paul Kies and Larry Kratzer, who were approaching Socorro in their car from the southwest, less than a mile from the landing site. They apparently witnessed either the landing or takeoff and reported seeing the flame and brownish dust being kicked up. Their story was reported in the Dubuque, Iowa Telegraph-Herald a few days later after their return. A family of five tourists from Colorado headed north also saw the oval object as it approached Socorro at a very low altitude, going east to west just south of town. It passed directly over their car only a few feet above it. After the encounter, the tourists stopped for gas in Socorro. Their identity was never discovered, but the story was learned from the service station operator, Opal Grinder, who reported the incident at the time and later signed an affodavot in 1967. According to Grinder, the husband told him "Your aircraft sure fly low around here!" and that the object almost took the roof off their car. The man thought it was in trouble since it came down west of the highways instead of the nearby airport to the south. He saw the police car headed up the hill towards it, he thought to render assistance. According to Stanford, another witness called an Albuquerque television station around 5:30 p.m. to report an oval object at low altitude traveling slowly south towards Socorro. 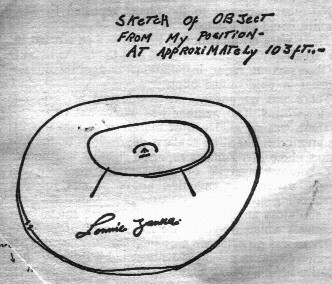 Several other stories appeared in New Mexico newspapers in succeeding days of other sightings of oval-shaped objects, including another landing case with burned soil near La Madera in northern N.M. Also similar to the Socorro incident, the FBI report on the La Madera case further noted the witness reporting a blue-white flame associated with the object, four rectangular, V-shaped landing marks, and several circular marks about 4 inches in diameter. Stanford also noted that there were a large number of aural witnesses to the object's loud roar during takeoff and landing. One member of the Socorro sheriff's office told him that "hundreds of persons" on the south side of town had heard it. Stanford said he personally spoke to two women who heard the roar just before 6 p.m. They said that there were two distinct roars, maybe a minute or so apart. In addition to the above witnesses, Stanford said there were three other persons who called the police dispatcher immediately following the incident, before it was ever publicized, reporting a bright flame. In October 2009, Stanford first publicly revealed that Sgt. Chavez, the first policeman to provide backup for Zamora, had privately confided to fellow police officers that he too had seen the object rapidly departing to the west over the mountains as he approached the site. However, in public statements, Chavez was firm that he arrived too late to see the object. When Chavez first arrived at the scene within a minute or two after the object had departed, he also noted that burnt bushes were still smoldering and Zamora appeared to be in a state of shock. Multiple policemen arrived soon after to help investigate, including Ted Jordan and James Luckie. All noted fresh burning at the site. Luckie and Chavez were quoted in the Socorro newspaper saying that clumps of grass and burned greasewood bushes were "still hot" when they arrived. Chavez was also quoted saying that dry grass was still "smoldering" as were the greasewood plants. Jordan later filled out a sworn statement saying, "When I arrived, greasewood branches were still smoking." Zamora was likewise quoted about the green bush "burned bare by exhaust heat" and that it was "still smoking several minutes after the craft's departure. "The FBI report written by the agent on the scene within two hours similarly reported that all first responders noted "four irregularly shaped smouldering areas." Chavez was further reported securing the area and scouring the ground looking for the presence of other human activity. He could find no other tire tracks besides Zamora's and was "adamant" that there was no other "track activity" (footprints or other marks) in the area. In addition, Chavez was also quoted in the report saying that the indentations appeared to be new: "He stated that the marks were definitely 'fresh', and the dirt showed evidence of 'dew' or moisture." Similarly, several policeman later told Stanford the whatever had produced the rectangular, wedge-shaped landing traces appeared to have penetrated into the moist subsoil, as the bottoms of the traces were moist for several hours, suggesting that the traces were freshly made. Hynek also commented on the freshness of the soil impressions in a letter to astronomer Donald Menzel: "I have the word of nine witnesses who saw the marks within hours of the incident, who tell me the center of the marks were moist as though the topsoil had been freshly pushed aside." The FBI investigator also observed that the rectangular marks "seemed to have been made by an object going into the earth at an angle from a center line" pushing "some earth to the far side." Also observed were "three circular marks in the earth which were small, approximately four inches in diameter and penetrated in the sandy earth approximately one-eighth of an inch." Speculation in Stanford's book was that these were ladder indentations for the crew to exit and enter the craft. The evening of the encounter, Army Captain Richard T. Holder (then the senior officer at White Sands, as the higher-ranking officers had gone home for the weekend) and FBI agent Arthur Byrnes, Jr. together interviewed Zamora. However, for reasons that remain unclear, the FBI asked that their presence at the scene be kept quiet. 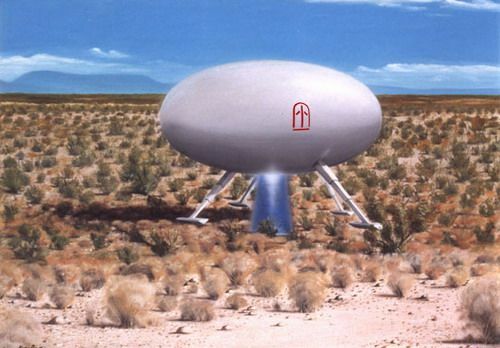 Zamora speculated that the object was some kind of newly-developed craft being tested at White Sands Missile Range or at nearby Holloman Air Force Base. Holder shot down this idea, and was later quoted in a Socorro newspaper as saying, that there was in military custody "no object that would compare to the object described ... There was no known firing mission in progress at the time of the occurrence that would produce the conditions reported." After interviewing Zamora, Holder and several military police officers went to the scene. Using flashlights, they cordoned off the site, took measurements and took samples of the sand and the scorched bushes. The claim of "fused sand" being recovered from the landing site was for some time unsubstantiated; even Hynek said he had not heard such rumors during his investigations. The next morning, a Sunday, Holder took a telephone call from a Colonel at the Joint Chiefs of Staff. As a young Captain, Holder was surprised and nervous to be speaking to such an important, high-ranking officer. At the Colonel's command, Holder gave a report of his investigation over a secure scrambled line. Even years later, Holder would wonder about such important U.S. military officials, "why in the world were they so interested?" Astronomer J. Allen Hynek (Blue Book's consultant) arrived in Socorro on Tuesday, April 28. He met with Zamora and Chavez, and interviewed them about the encounter. 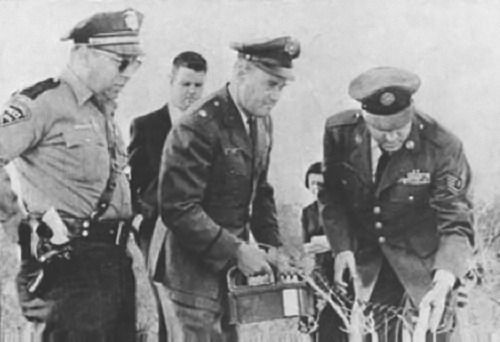 Hynek and Air Force Major Hector Quintanilla initially thought the sighting might be explained as a test of a Lunar Excursion Module, though after some investigation, Hynek determined that this could be definitely ruled out as an explanation for what Zamora saw. In a memorandum Hynek wrote, that "Zamora & Chavez were very anti-AF [Air Force]". The Air Force was suggesting that the affair was a hoax, but Zamora was "pretty sore at being regarded as a romancer" and it took over half an hour for Hynek to "thaw him out" and hear the account from the only eyewitness. Hynek also wrote that "The AF is in a spot over Socorro:" they were also suggesting that the encounter could be attributed to Zamora having seen an unidentified military craft, though no craft could be matched to Zamora's report. Hynek agreed with many others that this explanation "won't go down" as plausible. Hynek further wrote "I think this case may be the "Rosetta Stone" ... There's never been a strong case with so unimpeachable a witness." Also noting his growing frustration with Blue Book, Hynek wrote, "The AF doesn't know what science is." 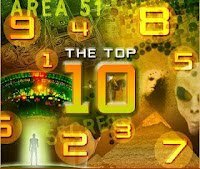 In 1968, physicist and UFO researcher James McDonald located Mary G. Mayes, who asserted that when she was a Univ. of Arizona doctoral student in radiation biology, she had been asked "to analyze plant material from the Socorro site. Afterwards, she was to turn in all records and samples, and heard no more about it." When interviewed by McDonald, Mayes reported that she and two others had worked on studying physical evidence from the Socorro site, but she could not remember the names of the others. According to Mayes, she had examined the site the day after the event, and had gathered plant samples for analysis. Mayes later determined that the plants which had allegedly been burnt by the UFO's flames were, unusually, "completely dried out". Mayes also found no evidence of radiation, but found "two organic substances" she was unable to identify. Mayes also reported to McDonald an area of apparently "fused sand", where the sand had taken on a glassy appearance, near where the object had allegedly landed and then departed. The area of glassy sand was roughly triangular, measuring about 25 to 30 inches (760 mm) at its widest, though it gradually tapered down to about 1 inch wide; it seemed about a quarter of an inch thick. Mayes thought the glassy areas looked as if a "hot jet hit it." Mayes said she would investigate to determine the other people who investigated the site, but McDonald's files give no indication she ever contacted him about the subject. According to reconstructions of the event from Zamora's account, the time was probably no more than 20 seconds from when the object went to silent operation, rapidly accelerated, and then faded from view near Box Canyon, a distance of about 6 miles (9.7 km). Assuming constant acceleration, these numbers can be used to estimate the object's acceleration, average speed, and final speed. The acceleration would be given by 2d/t^2, where d is the distance of 6 miles (9.7 km) or about 9600 meters, and t is the time of 20 seconds. The final speed would be 2d/t and the average speed d/2. This works out to a final speed of 2160 miles/hour, an average speed of 1080 miles/hour, and an acceleration of 48 meters/sec^2, or almost 5 times Earth gravity of 9.8 meters/sec^2. These high values rule out many conventional explanations, such as a helicopter or balloon. A high-performance jet aircraft or rocket propulsion could conceivably produce the accelerations and supersonic speeds, but neither forms of propulsion are silent. The Air Force report on the incident also said that they analysed the soil and found no evidence of chemical propellants, as might be expected from a jet or most rocket engines. Further, no contemporary craft was capable of vertical take-off and such high speeds. 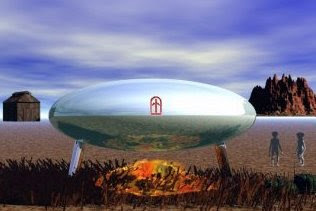 The oval object described by Zamora also lacked any wings or other external structures that might have provided lift.